1. Enables long term storage of wheat. 2. Self reliance and homemade bread making skills. Since we’re a preparedness blog, one very good reason why you should be milling your own flour is to enable long term storage of wheat! More specifically, wheat berries. A properly sealed and stored bucket of wheat will last for decades! Wheat berries will not begin to lose nutrients until you actually mill it to make flour, making it a great choice for storage. 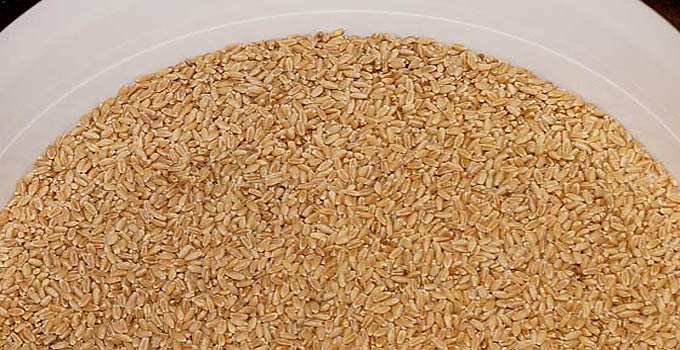 There are lots of calories in a 5 gallon bucket of wheat, making it an excellent part of your food diversification plan. 630 calories in one cup of hard red wheat berries. 75 cups of wheat berries in one 5-gallon bucket. 47,000 calories in one 5-gallon bucket of wheat berries. Do you know how to make homemade bread? It’s really quite easy. Just from a preparedness standpoint, knowing how to make your own homemade bread is a good basic kitchen skill. Unfortunately the vast majority of the people only know which aisle in the grocery store to buy their bread. Beyond that, they’re SOL. When you control the ingredients that go into your own foods (e.g homemade bread), you control the health attributes. Consuming wheat bread and other foods from whole wheat is apparently healthier than eating foods from processed-bleached flours. Even if you buy whole grain flour at the grocery store (already milled), you have little idea how long it has been sitting there on the shelf or how long it has been since it was milled. Milling your own flour will remove any doubts about the freshness and nutritional benefits you will be receiving. Fresh milled flour contains the most nutrients. When you mill only what you need, you’re always consuming peak freshness. After the initial outlay for a flour mill, you may find that it costs less to make your own bread than buying store bought bread. A typical 5-gallon bucket will hold 33 pounds (528 oz) of wheat berries after subtracting the weight of the bucket. Wheat berries weigh about 7 ounces per cup. My bread loaves require 3 cups of wheat berries for milling. That’s 1.3 pounds (21 oz). Each 33 pound bucket of wheat berries will make about 25 loaves of bread. Which Flour Mill To Buy? We have both an electric flour mill and a hand flour mill. Obviously milling your flour by hand takes a lot longer! However for the sake of higher level preparedness it’s a good idea to have one! This is my hand grain mill. It was expensive, but it will last ‘forever’. I have a Grainmaker mill, made in Montana im pretty sure, i love it. I have a GrainMaker also. Love it too. Which reminds me it is time to get up and grind since it is bread day! I actually have a few different hand crank grain mills, a Lehmans own, a Rhetzel with both metal and stone burrs and the Grain maker. They all do the job. The lehmans was the cheapest, bought a couple of them on sale figuring i could maybe trade one after things go down hill, the Rhetzel was the second i bought, i like the stone burrs for grinding real fine flour, good for smaller grains like amaranth, i want to get a 12v DC motor to hook to the grinder, set it up with a gear reduction so i can get more torque, will make grinding less of a chore, the bike power setup from grainmaker is kinda cool too but expensive last i checked and dont have a bike! A while back, I read an article about adapting an old Remington sewing machine treadle to power a Grainmaker model 99 grain mill. The lady that wrote the article said it works just fine. Lived all over, including Hawaii. I can not imagine what it would be like there with a shipping strike. I too have a Grainmaker mill. Absolutely love it. The best bread is made from fresh flour and I don’t care what kind of flour it is or type of bread. I started grinding flour with a little manual Victorio grinder. What a difference it made when i upgraded! I find I use it more often now since it is even easier to grind my own wheat. I used to mill my own wheat, (with a manual mill, talk about a workout LOL). But, it got lost in our move. I need to look into getting another one. My wife and I don’t eat much bread (from wheat flour), but since we’re surrounded by wheat fields, I picked up an old antique Atlas grain mill a few years ago. It’s the type that clamps onto a table edge and has a hand crank (no flywheel). I tried it out shortly after I got it, and found out that the grinding surfaces are about worn out. I’m not sure how many times I would have to run my wheat through it to get fine flour. I was doing my test outside (where I didn’t have to clean up my mess), and the blowing breeze kept blowing my flour away leaving me with the chunks. LOL! It would probably work in a pinch, but it would have to be a painful pinch. I like Pleasant Hill Grain. Lots of variety and nice clean grain. Free Shipping. You can get samples of grain also. I buy from, “To Your Health Sprouted Grain”. They have flour and sprouted grain you can pruchase and mill yourself. Sprouted grain is so much better for you not so much trouble digesting it. They also carry sprouted ancient grains which gives you the best of both worlds. There is a great deal of research on both on the web. Yes it’s a bit more expensive but I mix ming half and half and think I am doing okay for myself in a SHTF situation. Normally I just use sprouted grain. preparednana, I agree with you! Using soaked, sprouted or sourdough is the healthiest. Especially if you use ancient grains. Right now I am using Einkorn grain. It is delicious!! I have learned how to sprout my own grains. It is so easy to do! Saves on the budget too! When I first started milling my own flour I purchased my initial supplies of grain from Breadtopia. Now I purchase Augason Farms products from Walmart online and Amazon after watching for good prices. Because I have Amazon Prime I get free shipping and the big W will ship free to your nearest store for pickup. Some people will want certified organic wheat harvested by Vestal Virgins using Stone Age flint tools during the Winter Solstice. Me, I just want clean, quality grain effectively packaged for storage so Augason Farms is fine. There two basic types of wheat, hard and soft and they’re even subdivided into red and white wheat. For bread you want to use a hard red or hard white wheat. It will have a high protein content which results in the development of adequate gluten to give bread a good structure. The softer wheats are used for other baked goods, pancakes and biscuits for example. When you start baking with home milled flour you will find it different than store bought products so there’s a learning curve in using your own, hand made flour. Be prepared to do some research and experiment. It’s very rewarding to discover the taste of fresh flour and the nutritional advantages it offers. Nailbanger , its still listed white is on sale. Blue, be a good dog hold down the fort, don’t pee on the floor and stay out of the trash! Thanks for stopping in while NRP is AWOL. Now, please explain to him that he is needed here and that he needs to wrap this AWOL thing up post-haste already. With much thanks and lots of pets, your friend So Cal Gal. Someone is still angry because I said that Ken used proper English to communicate his topics in a clear and correct way. I criticized the way many bastardized our English language on twitter and in texting. It was not a slight against anyone in particular. I will try to make my comments unambiguous and curb my use of big words. 🙂 🙂 Blue, ask my friend to come back. Blue, tell NRP if he is gone for more than 30 days it is considered desertion and we will ALL come and divide up his stuff. Toilet Paper too? Say it isn’t so. Blue, Tell him we love him, miss him and want him to come back. After all it’s protection for his stash of TP. see no one suspects you when you are old and then you pull out that AR-15 from your big old lady purse…. REALLY??? Are you positive you did not nose/shove him into the hall closet? Don’t you think it is time to move your 125lb backside to let him out. I use oat flour, oat bran and olive oil with the hand ground wheat in mine for cholesterol. I calculated that two slices a day give me the correct amount to eliminate the C. Our yearly check up is next week. Will see how diet as opposed to drug is doing for that. We grew a heritage field corn, Bloody Butcher, this year. I have been grinding that for corn meal. It’s a little pink! Tonight I’m going to make cornbread with it to see if it’s worth growing more next year. Very interesting.Let us all know how it turns out. Delicious and moist! I’ll change up the recipe a bit and experiment with it. Good for you I’d love to be able to put in some rows of Bloody Butcher but no room. Do you have to slake the corn like for making masa if your grinding it for corn meal? Just curious, corn is about the only grain i can successfuly grow and dry down enough to use, everything else is destroyed by birds or mildew. Nailbanger, I just threw the corn in the hopper of my Nutrimill grain mill, and it produced a very fine corn meal. I googled about grinding corn after you asked if I had to slake the corn. Apparently it is more nutritious and easier to grind if it is slaked (nixtamalized) first. So thanks for asking! That is something I need to experiment with. Does anyone else have any experience with that? You should grind nixtamalized corn with steel burrs if you haven’t thoroughly dried it to a moisture content less than 12%. One technique that Alton Brown used in an episode of Good Eats was to grind freshly nixtamalized corn in a food processor. If you don’t grind it you’ve got hominy or pozole. The problem, pellagra, was the result of a vitamin deficiency. And it was common for people whose main diet consisted of ground corn. Nixtamalization, a technique developed by Central American peoples well before Columbus discovered America, makes the niacin in the corn available to digestion. Old CC took the corn back to Europe and the Old World but didn’t have the ‘secret’ process. The Indians used lye derived from wood ashes. Now most nixtamalization is done with slaked lime, calcium hydroxide. Pickling lime is one product that you can use to nixtamalize corn. Check the web for details of the process. Like OldGuy said, nixtamalization is an important step for adding nutrition to ground corn. I’ve used wood ash for my lye. Since I burn wood, I’ve got a free source. That’s what the Indians used. Couldn’t be simpler. Roughly the same volume of dry ash as the corn you’re treating. Roughly three volumes of water. Stir, soak over low heat (like on top of the wood stove) overnight. Rub the now-gelatinous shells off in running water and Viola. You’ve got hominy. Eat the hominy as is (we like it with a bit of butter and salt) or dry it for grinding. You can mash hominy into Masa and make corn tortillas. Did that too. A bit of salt in the mix and they tasted just like Fritos. BREAD MACHINES questions………….. My daughter in law wants one for Christmas. I have read reviews on Amazon. What is the consensus the owners here. If she has never made bread from scratch, have a feeling she will like it. The youngest sister never learned how to make bread the old fashion way, only out of a bread maker. She loves hers, and I was given one for a Christmas present, it collected dust bunnies. If I still had it, probably use it for the kneading part of the bread making process, to save time. Ha Ha !!! Not this girl……………… She already said the other way was TOO much trouble. Sad. I like her though. Thanks Ken. I remember the article now. I have a zojirushi. I bought it from King Arthur. I have had quite a few over the years and this has been the best. Make sure whatever you get, that it has 2 paddles as it will mix better. I use it to mix bread dough and then take it out to make what I want and bake it in the oven. I make a wholewheat bread that is ok. I normally use the recipe by Sue Gregerson where you let it sit overnight. What i notice is that it is a smaller loaf than we normally get at the store- that is ok I don’t need huge slices. What is more of a problem is that it doesn’t hold together like store bread. I’ll be making bread in the next week or so and plan on trying the recipe that Ken included. I store mostly hard white wheat in buckets with some soft wheat in #10 cans for other baking. How strange- I found my comment posted on an old article. I appreciate my Kitchen Aid mixer in my old age. Has a dough hook. Then I do a little bit of hand kneading after I let mixer do the work. If budget allows and they can be on sale at times. especially during the holidays. Check the Base Exchange for the bread machine during the holidays. Better yet, try the on line store. Believe they have a email notification when specials are coming up. That way you will know if they have the better pricing vs the open market. Informational, Ancient Grain, Einkorn, requires less kneading and puts a slightly stickier loaf into the pan. I use a dutch oven or a cast iron loaf pan. Love the ancient grains for many reasons. Less effect on blood sugar also. Nana, I like the ancient grains too. I usually put some in the mix. We have the Country Living hand mill and it is top notch. The only thing it is one heavy weight unit and must be bolted down. Made my wife a workstation bread table and covered the top with copper sheet. With the shelves underneath and the mill at one end it works great. It looks old time county farmhouse with milk paint and copper hardware. Every woman that sees it want to know if I’m going to make more to sell. Only reason I made this one is the copper was fall off from a restaurant remodel my company did. If you get this mill order the bean and corn augur and a replacement wheat augur. One is none and two is one. I like the freshness of the ground berries, especially during the holidays. We usually make cookies for several doctors offices, and they always ask are we bringing cookies to their business. Even had the staff ask why ours taste better, and tell them it freshly ground flour. We are one of the few areas that actually has a flour mill, an they grind every day. One can purchase fresh ground flour for every day use, and specialty flours when they have the items in stock. Hi all ,,,,,ya it’s me ,,got a question for you all ,,,what grain would you like to see grown? Don’t care if it’s some old time odd ball or such ,,don’t feel right to not be planting. Still have drill and equipment to do it ,,hard to see weeds in the field ,,don’t need to make money on it just would want to break even ,hobby farm you know. Hot chocolate and donuts time. Once the dirt is under the farmers nails it never leaves.☺ You might try a little of each variety, so that you can see what germinates. Do you know which varieties you might have to experiment at the home ranch. Do not worry the grinder you have for wheat is the same one we have, it might be a little loud(rolwl)but it still works great. Do not grind coconut in the machine or you will be cleaning it out for quite a while. Yes, it was a good idea at the time😝,an I am still cleaning it out every so often. Nailbanger ,,,,,don’t know about that ,we might have too much fun ,, on second thought way toooo much fun. How’s the lady doing ????? I mill my wheat with my vitamix. It does a great job. My problem will be when the power goes out. I have one of those $60-$70 little hand grain mills. It will take forever to grind 5 cups+. I do have several cans of #10 of whole wheat flour from Sam Andy that i bought from someone selling out their food supply. This wheat is great and was canned before they started fooling around with the composition of wheat. I am saving some just in case. All this talk about grinding grain,,, im going to go grind up some wheat and oats and make bread to go with our pasta! A mill should be capable of being manually hand or motor driven. I have a whisper mill, which isn’t made anymore. Wonder Mill bought them out. They still look the same but the insides are different, I think. I have had my whisper mill for 15 + years and it is still going strong. I also have a Country Living Hand Grain Mill. I have only used it to grind grains for the chickens. But I can tell that it will work just fine if needed. I just made a new Einkorn Sourdough Starter. It is working great!! Love it and don’t have to buy yeast. Made some delicious cinnamon rolls a couple of days ago. They went over great. And everyone is loving the artisan bread! We have a Country Living mill and love it. It’s bolted onto our kitchen island and every new person who enters our kitchen always asks what it is. The funny thing is that everyone asks after they have put their hand on the arm of the wheel, turning it. Its interesting how people, especially children, gravitate to the mill. Since I messed up my foot, I have gotten inventive with trying to do stuff while trying not to walk or stand much. (I’m not doing such a good job ‘healing myself.’) But, I pulled out our old bread making machine since it makes bread FOR us, and put it to use. lol The machine was a gift to me many, many years ago and even though I’ve used it here and there, I’ve always preferred to make bread with my own hands. The machine I have makes a small loaf and they’re round, as many bread machine loaves are. Since we make all of our own lunches and many of them are sandwich lunches, we can run through that loaf of machine-made bread in 2 days. So just this morning, I ordered the Zojirushi, recommended by Ken and oldlady. I had been eyeing it ever since Ken wrote that article, even before I injured myself….so now I have one coming my way. OMG, I think I’m becoming a consumer-driven, gadget-oriented, lazy old woman! Becoming or became a consumer-driven, gadget-oriented old (your as old as you feel) woman maybe, lazy NEVER LOL..
What a timely article! We’re heading out to an Amish store this morning to pick up 50# of wheat berries. We have quite a bit stored, but we also stored several 1 gallon jugs of whole wheat flour that’s gone off prime. The loaves have been getting smaller and denser as it ages. At first we thought it was bad yeast, but after checking the yeast dates realized flour doesn’t store well. We’ve got a Country Living Mill, with the electric motor accessory kit. Also, knowing a backup is always a necessity, I bought a DC gearmotor and the proper size drive pulley. You have to be careful when electrically driving the mill, RPMs over 90 will overheat the grinding heads. Due to arthritis in my wife’s hands we recently bought the Zojirushi bread machine. It’s great! You can remedy the ‘life’ in your WW flour by adding a bit of gluten flour. It’s not actually a flour, per se, but will help your loaves rise. Just do some searches online to read about it and what proportion you would use for a recipe similar to those you’re making breads with. What wheat do you buy and what do they charge in your area for 50lbs? The soft wheat here is the most expensive at about $35, but the hard red and whites are about $26 per 50 lbs. I enjoy the Golden 86 the most for my hard white. Wow Oldhomesteader – that is an amazing price! There is an AMerican Guinea Hog farmer north of me that got spelt so cheap he was feeding it to his pig…but that was a neighbor of his. The stuff I am buying is being shipped in from out west and I feel fortunate to be able to get it. I think the whole wheat is going to be like the vanilla pretty soon ….. Out of sight price-wise. DAMedin NY,,,,,i suggest you find someone growing near you ,,offer to help in some way ,i use to trade for help. ,,offer to help clean up or help bagging. ,,,learn to clean your grain your self. ,, not hard to do,,,,,,,,ask for leftover ,,some time as much as hundreds of pounds ,,,,grain is grown everware ,,learn to use what’s local. How’s the well power system coming? Soft White wheat berries are non existent in this area, and hard white wheat last time was pushing $30+ for 50lbs. Haven’t found the time to stop at the flour mill in quite awhile. In a way wondering if the price will be so high that it will be my last trip into that store. Love going in there they have some of the neatest things. Including a grinding mill out of Idaho that is so easy to use, the display model is still working after six years of kids & adults playing with it. AC, I wish we had a mill around here. Most of the milling here is done strictly for the animals and I am not always happy with how dirty it is. We only eat the stuff that is shipped in that I buy from the Amish as it has been cleaned. I even special order my hog food from an organic grower a couple hours away from here to get decent food for them.